When is coming in last place an accomplishment? When you come in last in the Tour de France. Prufrock at the American Conservative directed me to this book review in the Times Literary Supplement this morning. 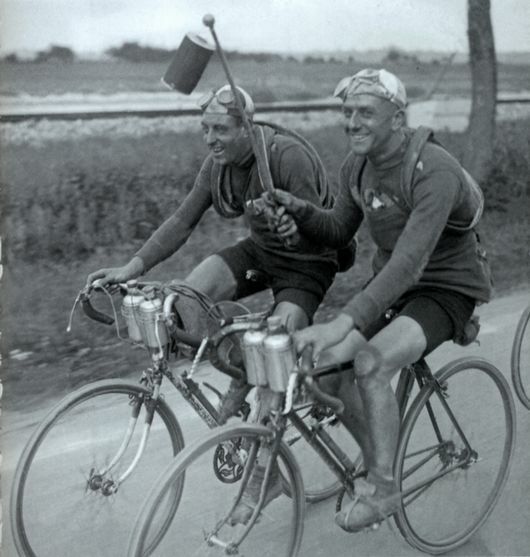 Max Leonard’s Lanterne Rouge is about famous last place finishers of the Tour. I used to work near the airport and I rode my fixed gear everyday from Coxwell and Sammon, about 26kms one way. It was a steady uphill climb that took me about an hour to complete, longer in winter. I’m planning a trip to Niagara-on-the-Lake with my sons – we’re riding our fixed gears from Toronto, a trip of about 140kms which should take us about 5 hours. I can’t imagine doing the Tour – a three-week, 3,664-kilometre odyssey – on a fixed gear bike! This year’s winner – Vincenzo Nibali – completed the race in just under 90 hours. 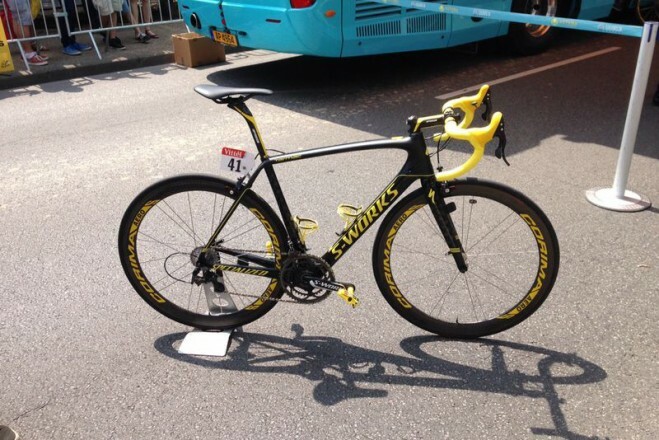 Nibali rode a multi-speed, carbon-fibre Specialized S-Works Tarmac. Update: Ji Cheng of China claimed the lanterne rouge at this year’s Tour. He finished a respectable six hours behind Nibali. So what do they expect Israel to do? Die? They are “profoundly perturbed” it seems that the Canadian government is taking “an unbalanced and partisan position” on the violence in Gaza so they offer their own “unbalanced and partisan position”. So Israel is bound by these laws and tries to live up to them but Hamas is not bound by these laws and does not live up to any standard of human rights and justice. And who do these pointy-headed goofs condemn? Israel. What do they want Israel to do about these rocket attacks? Nothing? Need I remind my readers that Hamas is dedicated to the destruction of Israel, and indiscriminately kills Jews, Christians and other non-Muslims. Those rockets that Hamas sends into Israel are targeted at civilians. I guess Jews just are not dying enough for these folks. Here’s Spengler (aka David P. Goldman) on the crisis in Israel. He blogs regularly at PJ Media. It’s like the old joke: Why do Jewish men die before their wives? Because they want to. Civilizations for the most part die because they no longer want to live. That is the nub of my 2011 book How Civilizations Die (and Why Islam Is Dying, Too). They cease to believe in their own future and distract themselves from the prospect of extinction as best they can. Hellenistic Greece was the first universal demographic disaster; it gave us prototypes of the steam engine and the computer (via Hero of Alexandria) as well as the modern literary forms. But even wealthy men exposed their daughters and the population imploded. When Aristotle taught that men naturally seek the good, the overwhelming preponderance of evidence had already turned against him. Most men seek nothingness. Soon the last surviving remnants of the classical world will disappear. In another generation, more people will speak Hebrew than Greek. I do not mean to sound cruel, but the best thing you can do for victims of a dying culture is: Don’t be one of them. Individuals who want to live have the option of changing cultures. I do not mean that Israel (or anyone else) should go about killing off enemies in order to satisfy their death wish. God forbid: life is still sacred to us even if it is repugnant to them. Neither do we have to commit suicide in order to accommodate our crazy neighbor’s death-wish. We might try to talk him down from the roof, but we are entitled to step aside when he jumps. It is not in our power to persuade suicidal civilizations to carry on living. Ultimately it is our job to contain the damage to ourselves. We cannot help but accept some civilian deaths while engaging an enemy that seeks the maximum number of civilian casualties. I actually started Knausgaard’s A Man In Love in the Spring but it’s a struggle. And there are six volumes!! 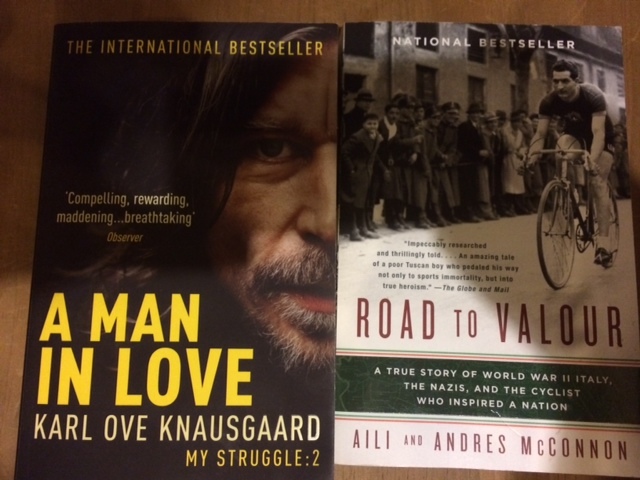 Road To Valour is a biography of Gino Bartali, the Italian cyclist who won the Tour de France in 1938, before the Second World War interrupted the Tour, and won again after the war in 1948. This book describes his compassion and bravery during WWII. My advice: read everything and anything W.G. Sebald has written. A Place In The Country is a series of essays published for the first time in book form in February 2014. I read most of this at the cottage. It’s too bad Sebald died in a car crash in 2001. 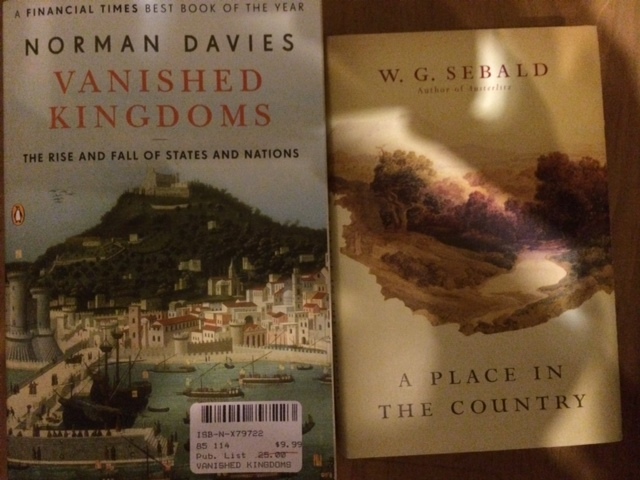 I like Norman Davies’ Vanished Kingdoms because I can read any chapter I feel like reading without having to read any other chapter before it. The book is a great reminder that nothing lasts forever. Found this article from the January 4th issue of the The Spectator and I thought I would share it with my followers. You’re welcome. If you see things in that way, then you are likely to believe in conserving civil society, by accommodating necessary change. New Labour sought to weaken our society externally and to divide it internally by its unquestioning acceptance of the primacy of EU supranational authority, internally by indiscriminate immigration, class warfare and the ‘reform’, which usually meant the politicisation, of our hallowed institutions. Conservatism, by contrast, aims at a cohesive society governed by laws of its own and by the institutions that have arisen over time in response to its changing needs and circumstances. Such a society depends upon a common loyalty and a territorial law, and these cannot be achieved or retained without borders. But we find ourselves bound by a treaty devised by utopian internationalists in circumstances that have long ago disappeared. The EU treaty obliges its member states to permit the ‘free movement of peoples’, regardless of their desires or their national interest. With its open welfare system, its universal language, its relative wealth and its carefully defended freedoms, our country is the preferred destination of Europe’s new wave of migrants. At the top of every conservative’s agenda, therefore, is the question of immigration: how to limit it, and how to ensure that the newcomers integrate into a civil society in which free association, freedom of opinion, and respect for the law are all axiomatic. Conservatives recognise that the right to vote out our rulers and to change our law is the premise of democratic politics. Whenever possible, they believe, our law should be made in Westminster, or in the common-law courts of our kingdom, not by unelected bureaucrats in Brussels nor by courts of European judges. Until recently the conservative emphasis on civil society has led to an equal emphasis on the family as its heart. This emphasis has been thrown into disarray by the sexual revolution, by widespread divorce and out-of-wedlock birth, and by recent moves to accommodate the homosexual lifestyle. And those changes have to be absorbed and normalised. Ours is a tolerant society in which liberty is extended to a variety of religions, world views, and forms of domestic life. But liberty is threatened by licence: liberty is founded on personal responsibility and a respect for others, whereas licence is a way of exploiting others for purely personal gain. Liberty therefore depends on the values that protect individuals from chaotic personal lives and which cherish the integrity of the home in the face of the many threats to it. Conservatism is a philosophy of inheritance and stewardship; it does not squander resources but strives to enhance them and pass them on. For conservatives, environmental politics needs to be rescued from the phony expertise of the scaremongers. But it must also be rescued from the religion of Progress, which urges us to pursue growth at all costs and to turn our beloved country into an array of concrete platforms linked by high-speed railways and surveyed from every hilltop by eerie wind-farms. Those beliefs are difficult to act upon now. Through quangos and official bodies, the state has been amplified under New Labour to the point of swallowing private initiatives and distorting the long-established charitable instinct of our citizens. Regulations make it difficult for people to associate, and the nonsensical rulings of the European courts constantly tell us that, by living according to our lights, we are trampling on somebody’s ‘human rights’. Conservatives believe in rights but rights that are paid for by duties, and which reconcile people rather than divide them. Left-wing thinkers often caricature the conservative position as one that advocates the free market at all costs, introducing competition and the profit motive even into the most sacred precincts of communal life. Adam Smith and David Hume made clear, however, that the market, which is the only known solution to the problem of economic co-ordination, itself depends upon the kind of moral order that arises from below, as people take responsibility for their lives, learn to honour their agreements and live in justice and charity with their neighbours. Our rights are also freedoms, and freedom makes sense only among people who are accountable to their neighbours for its misuse. This means that, for conservatives, the effort to reclaim civil society from the state must continue unceasingly. One by one, our freedoms are being eroded: free speech by the Islamists, free association by the European Court of Human Rights, the freedom to make our own laws and to control our own borders by the European Union. We conservatives value our freedom not because it is an abstract possession of the abstract individual, but because it is a concrete and historical achievement, the result of civil discipline over centuries, and the sign of our undemonstrative respect for the law of the land. Here’s a post from Rod Dreher from yesterday. I had mentioned that Rod rarely writes about Canada but this is one of those times. In a joint statement today, the Catholic Independent Schools of the Vancouver Archdiocese (CISVA), and the family of Tracey Wilson, an 11-year-old diagnosed with gender dysphoria who had attended a Catholic school, announced the CISVA approval of a new policy that accommodates gender expression and students with gender dysphoria. The Wilson family is applauding the CISVA for paving the way towards accommodating gender expression and gender dysphoria in youth. It will be the first Catholic school district in Canada to have such a policy. The new policy was developed after Tracey, who was diagnosed with gender dysphoria, filed a human rights complaint because her school did not accommodate her request to be treated as a girl. The human rights complaint was resolved after the CISVA approved the Gender Dysphoria and Gender Expression policy and paid to the Wilsons a sum that both parties have agreed will remain undisclosed. “Who spells her name without capital letters.” Good grief. Gaze upon the sobriety-inducing visage of barbara findlay, and unlearn oppression — or else she’ll sue. Does this seem even remotely just to you? Do I risk becoming a target just by posting this and disagreeing with the outcome? It’s scary. Perhaps the State and it’s human rights minions will overlook a small fry like me – for now!